13cm x 7cm x 8.5cm. 13 cm tall (5 inches). Weighty figurine of a Jungle Elephant by Leonardo. 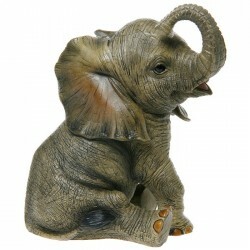 Part of the Leonardo range of wild animal figurines, these ornaments are finely detailed and well made. All figurines have fantastic true to life colouring and features, and are very well packaged.